Citation: Mendonça, Ângelo, David Graff, and Denise DiPersio. Spanish Gigaword Second Edition LDC2009T21. Web Download. Philadelphia: Linguistic Data Consortium, 2009. 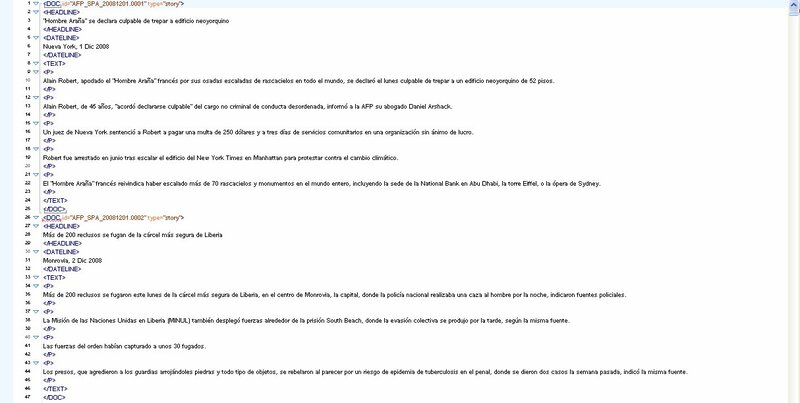 Spanish Gigaword Second Edition is a comprehensive archive of newswire text data that has been acquired over several years by LDC. This second edition updates Spanish Gigaword First Edition (LDC2006T12) and adds data collected from January 1, 2006 through December 31, 2008. The seven-letter codes in the parentheses above include the three-character source name abbreviations and the three-character language code (spa) separated by an underscore (_) character. The three-letter language code conforms to LDCs internal convention based on the ISO 639-3 standard. These codes are used in the directory names where the data files are found and in the prefix that appears at the beginning of every data file name. They are also used (in all UPPER CASE) as the initial portion of the DOC id strings that uniquely identify each news story. The overall totals for each source are summarized below. Note that the Totl-MB numbers show the amount of data obtained when the files are uncompressed (i.e. approximately 7 gigabytes, total) the Gzip-MB column shows totals for compressed file sizes as stored on the DVD-ROM the K-wrds numbers are simply the number of whitespace-separated tokens (of all types) after all SGML tags are eliminated. The following tables present Text-MB, K-wrds and #DOCS broken down by source and DOC type Text-MB represents the total number of characters (including whitespace) after SGML tags are eliminated.